Heat the butter or oil in a soup pot over medium-high heat. Cook the onions, carrots and celery until softened, about 10 minutes. Add the garlic and cook for another minute. Add the barley and cook for another minute. Add all remaining ingredients except for the parsley. Bring it to a boil, reduce the heat to medium-low, cover and simmer for 1 hour. Remove the chicken, dice the meat, and return it to the soup along with the parsley. Heat through and add salt and pepper to taste. This simple soup has tons of flavor and better yet, makes great leftovers! Rosemary is an incredibly delicious herb that is powerfully fragrant and flavorful. Just a little bit of it added to a broth goes a long way to infuse it with a wonderful aroma and depth of flavor. That combined with the nutty flavor and chewy texture of barley, a grain that’s super high in protein and fiber, makes this soup a real winner. And it’s low-fat and relatively low carb – score! Easy to make and tastes great as leftovers, this is a great go-to option when you’re in the mood for a yummy twist on traditional chicken noodle soup. Heat the oil or butter in a soup pot over medium-high heat and cook the onions, celery and carrots until softened, about 10 minutes. Add the garlic and cook for another minute. Add all remaining ingredients, except for the parsley. Bring it to a boil, cover, reduce the heat to medium-low and simmer for one hour. Remove the chicken and dice the meat. Return it to the pot with the parsley and heat through. Add salt and pepper to taste. 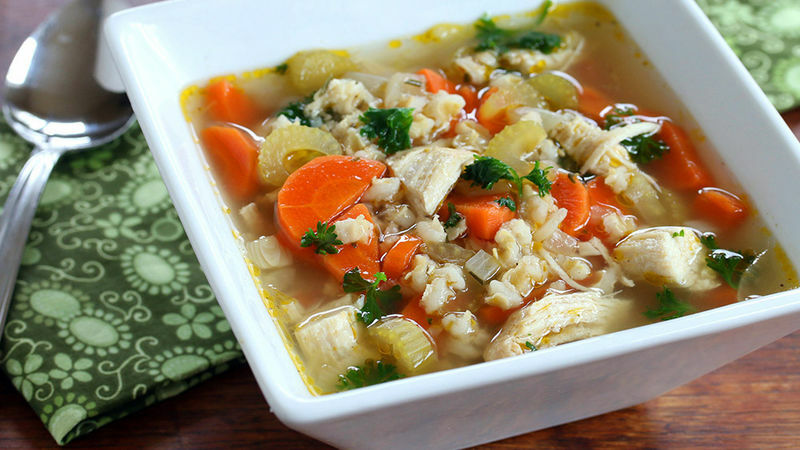 For more great chicken soups, visit Kimberly’s blog The Daring Gourmet.